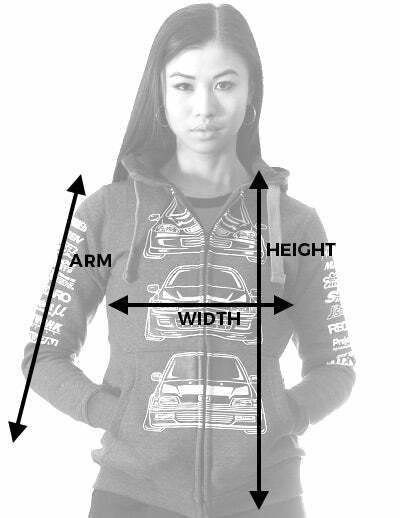 Printed on a high quality tailored hoodie, it features the Mitsubishi Evolution III, VI, VIII and X. It also includes the history of the Evolution in Japanese on the rear. Awesome hoodie design and excellent quality. I would highly recommend! Love the product and the service! Excellent quality and nice and warm too. Love my hoodie! Great fit! Great quality! Fits and feels great! Shipping was unexpectedly fast! Thanks so much! This hoodie is so cute! I can't wait until winter to wear it. It fits perfectly and really fits to the body. I wear normally S or XS, so I ordered S and it fits perfect. This vest is very very comfortable and keeps warm on cold days. Before I bought my own, I always borrowed it from my boyfriend. It's also great that the vest is Long and goes over the kidneys, others vests are sometimes too short and your belly is not covered if you sit down. The delivery was very fast, but the Post Office and the Zoll in Austria are very slow. So I've been waiting 10 days until I received my order and then they charged me 31€ extra because it comes from Australia. It took so long to arrive at my city (Brazil), but I know that is not your fault, delivery here is a shame. The product fits so well and the material is better than I was expecting!